Chicago is certainly not the first place you might think of to go gold panning or prospecting. Yet, there are actually a few places that are just a short distance from the city where people can successfully recovery gold by panning and sluicing. In fact, the sands and gravel along the shores of Lake Michigan actually contain trace amounts of placer gold. Few people know this, but you can actually use a gold pan and recovery some gold from just about anywhere around Lake Michigan. This gold is probably not local to the area, but rather it was brought down by glaciers from the Abitibi Gold Belt in Canada. As glaciers moved southward during past ice ages, they would bring with them gravels from the north. These gravels would become pulverized into a fine dust, and scattered all across the landscape. This is the reason that gold can actually be found in many waterway around Chicago, in both Illinois and Indiana. Now it should definitely be emphasized that the gold occurrences around Chicago are not of any significant size. There has never been any commercial gold mining operations in this area, and it is extremely unlikely that you will find enough gold to add up to much value. Don’t quit your day job! A few of the rivers that reportedly contain gold include the Mississippi River, Fox River, Rock River, Illinois River, Spoon River, and many of the tributaries in the northern parts of Illinois. The same can be said for nearby Indiana, where glacial outwash areas left behind gold bearing gravels as well. Now finding gold in Chicago, or anywhere throughout the Midwest for that matter, is no easy task. There just isn’t as much of it as there is in other parts of the U.S. 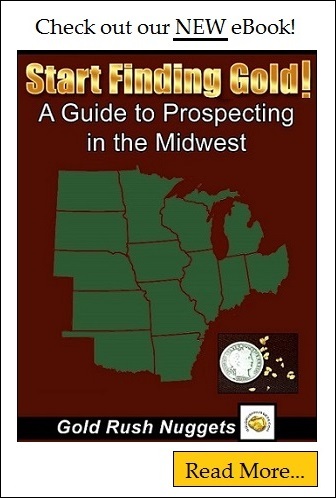 Still, many prospectors are able to find gold consistently around Chicago in both Illinois and Indiana by using special methods to get the gold. Remember that almost all of the gold is fine, meaning that you are not going to recover large nuggets here. For example, the gold that occurs along the shores of Lake Michigan is extremely tiny. It can be easy to lose out of your gold pan, and careful panning techniques are needed to not lose it. Mining equipment that has been designed specifically for capturing are retaining fine gold can be very helpful. Gold panning near Chicago can be a lot of fun, and a great way to get away from the city for a day. And if you find a good area, you might even be able to add a bit of gold to your collection.